We know that our dogs love going for their walks, and when they’ve developed a routine for walks, it can be really hard to break it. Still, your dog’s safety comes before their need to go out for a walk. When is it too cold to bring your dog for a walk? 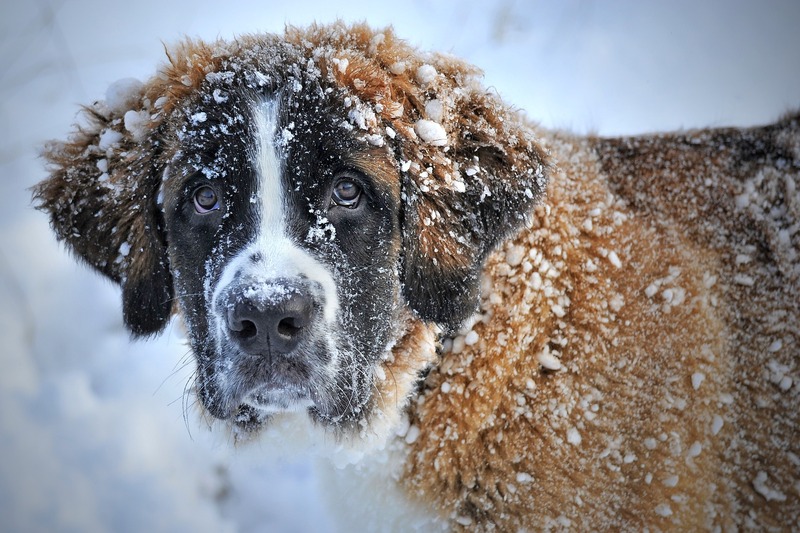 While much like us, our perceived temperature of “too cold” can vary with a lot of circumstances (such as if there’s wind, rain, snow, or otherwise), dogs too can have days where it’s too cold dependent on circumstance. A lot of whether or not it’s too cold to walk your dog also depends on how large your dog is and how much he or she weighs. It’s surprising to know that there really are only a few degrees difference between “no danger to your pet” cold and “dangerous to your pet” cold. 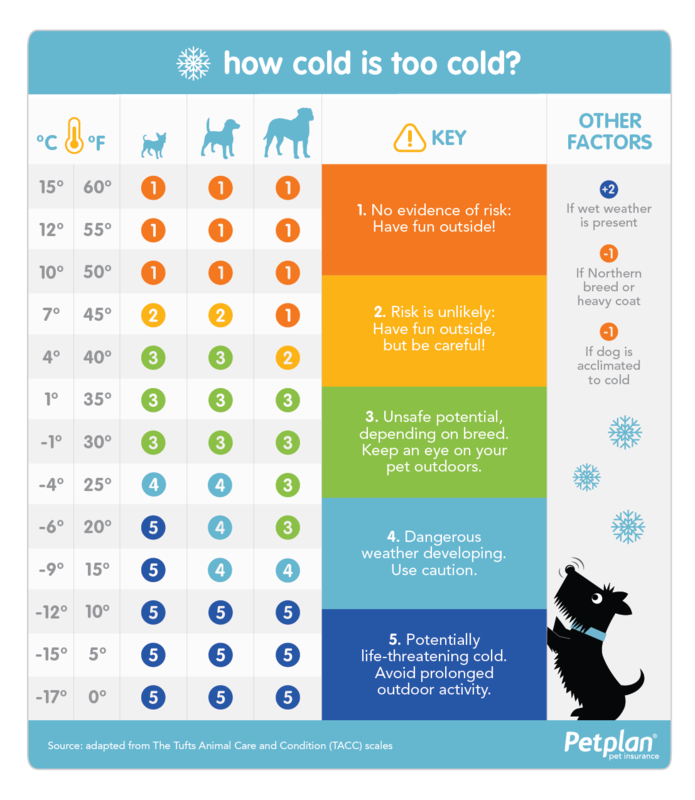 The Tufts Animal Condition and Care (TACC) system is a handy chart that can help you decide whether it’s too cold to go for a walk, or if it’s safe for your dog to head out with you. The chart handily tackles both fahrenheit and celcius temperatures so whether you’re used to imperial or metric measurements you can easily tell when it’s too cold for your dog. How much snow is too much snow to walk in? Ideally, you will not want to walk your dog in any snow that goes above his or her legs, keeping their core body from getting cold. Huskies, newfoundlanders, and other cold weather dogs need not apply! Can I walk my dog on ice? You can, but try to only walk for short periods of time. You don’t like slipping and falling, and neither does your dog. If your route has a lot of ice, you may want to put some balm on your dog’s paws (such as Musher’s Secret) or even booties. Remember that your dog’s feet get cold too, and if your dog’s feet get too cold, he may even refuse to walk at all! Does road salt hurt my dog’s paws? Road salt can dry out your dog’s paw pads, and if he or she licks it off, it is possible your dog might get sick. It’s best to give your dog’s paws a rinse when you get back for a walk just to be sure. As a general rule, if it seems too cold for you outside, then it’s probably too cold for your dog (again, Huskies and Newfoundlanders maybe not so much!). Keep an eye on your dog while they are outside to make sure your furry friend doesn’t get too cold, and never leave your dog outside over night.